Street foods are so special for we Indians, our taste buds craving for the spicy, desi, budget taste gets satisfied only when they are fed with the street foods and this taste is exclusive, irreplaceable which you won’t find in any restaurant or luxury hotel.No matter how much we try to avoid having food on street still that intruding aroma, the tangy desires triggering watery mouth drags us to have a dose of street foods.Udaipur is also catching up when it comes to street foods and there are many master chefs delivering their magical taste from the streets of Udaipur.We hunted for tempting street foods in Udaipur and we got satisfying results.Here’s the list of top street foods in Udaipur of the year 2017.The list includes the old as well as new ones who are unbeatable with their taste. 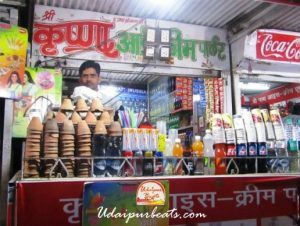 We have visited and reviewed all the street foods in Udaipur that we have listed, some of them we knew some we found out with the help of localites and friends. 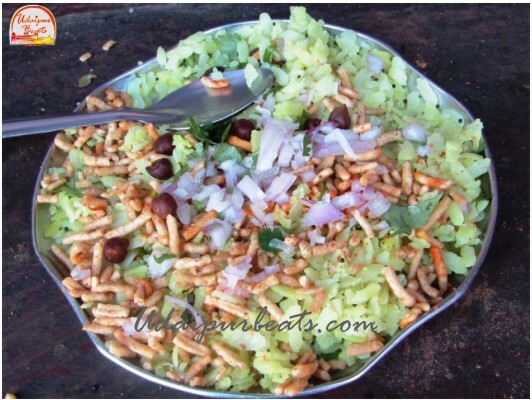 Poha(flattened rice) is the most loved snack in Rajasthan, Gujrat and Madhya Pradesh as it is yummy, light, fat-free and easily digestible. 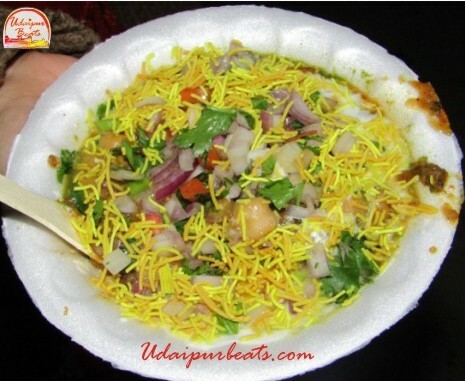 Poha is basically “Flattened Rice” and also known by the name “Chiuda” in other parts of the country.Jain nashta centre provides Delicious aromatic poha with yellowish green color, bearing aroma of green coriander, slight sweet n sour in taste, namkeen, boiled chana, and chopped onion sprinkled and they taste amazing. You can enjoy this morning snack even in the post-midnight hours and for this, you will need to reach Mohan Nashta Cente, Udiyapol.They are serving poha for 40 years and they are known for the awesome taste and their unique timings, they serve only between 2 am to 6.30 am.Narayan, the current owner claims to have started the trend of boiled chana in poha and the stall which is now a food van is named after his father who started this business.They also serve tea in kullad which makes an awesome combo with poha, this is the best option to quench midnight hunger or to take a break from late night studies. 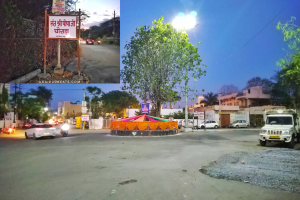 You can also head to Bholenath Nashta centre, Sukhadiya Circle who serves delicious poha from morning to afternoon.You can spot it as a light pink stall. 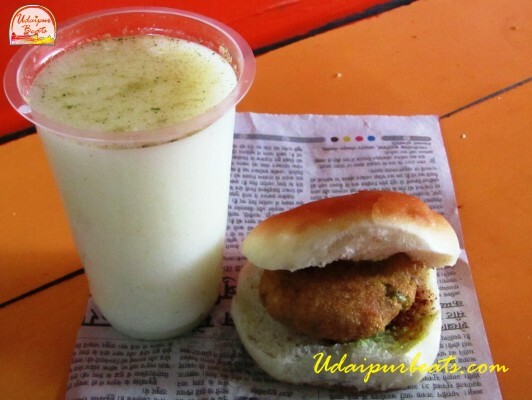 I am a great fan of vada pav thanks to some years of my life spent in Pune and Mumbai. 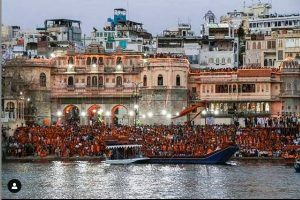 There are many Vada Paav sellers in Udaipur both new and old so I decided to taste them all and all I was looking for in Vada Paav is that “Authentic Vada Paav” taste. 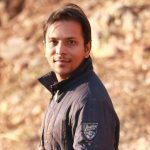 I tasted all renowned vada pavs of the city and met the best one at Poornima Vada Paav, Chetak-Hathipole Main Road, near Arvana Mall. They sell amazing Vada Pavs, I could relate to that ‘Authentic Vada Paav’ taste.They hugely differentiate themselves from others in terms of the taste, the crunchy potato patty placed in the horizontally cut bread bun with green chutney and dry red masala applied imparts it a toothsome authentic taste, they also serve Masala Chhach(buttermilk) which makes an awesome combo easing the consumption of Vada Pav although vada pav is a Marathi snack still it is so liked by people in Udaipur and it is also making into the list of widely consumed street foods in Udaipur. The potato patty in the pav(bread bun) has got the crunchiness which you won’t find in the vada pav selling in other places. The dry red lehsun masala is sourced right from Maharashtra to impart a native taste to the vada pav. 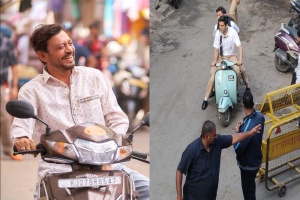 The vada pav is priced at Rs 10 and chhach(Buttermilk) at Rs 5.Poornima Vada Paav is owned by Mr. Yashwant Ji and it’s been 7 years since he is delivering quality vada pavs. 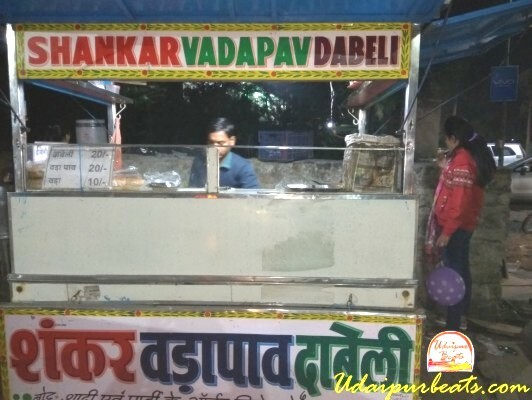 Shanker Vada Paav Dabeli, Near Happinezz ice cream parlor,sukhadia circle– Shanker Vada Paav is my next choice.The vada pav tastes good, they also heat the buns which you won’t find at poornima and apply green and red chutney(both moist). 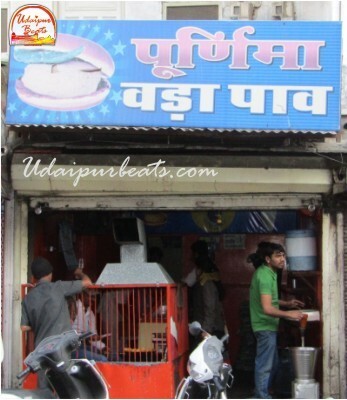 Mini Vada Paav at Nada Kheda chauraha, main road, Bapu Bazaar-Puranmal ji and son has been selling small sized vada pav and poha since 2009 with the name diamond vada pav.The taste of the vada pav is a deviation from the original taste as they add red chili, garam masala and laung(clove) to the stuffed mashed potato masala unlike mainstream vada pav , which contains kaali Mirch(black pepper), pudina(mint). 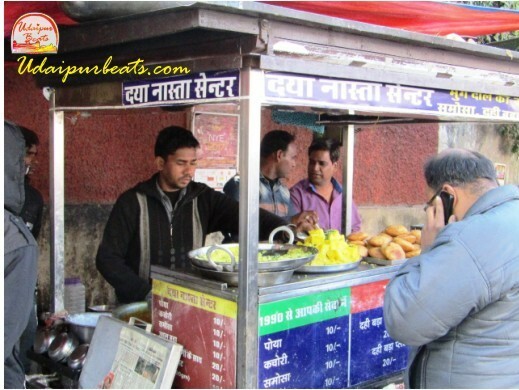 You get 2 vada pavs for Rs 10 and a plate of Poha for Rs 5, a fair deal for breakfast. 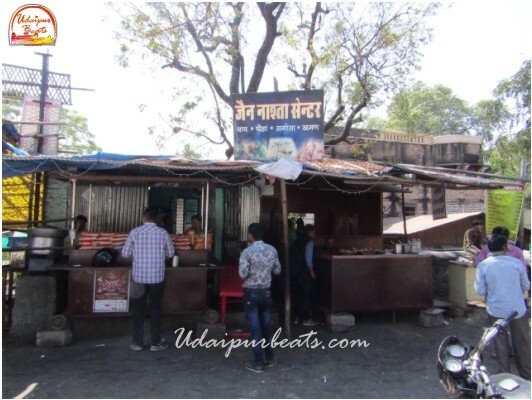 Venda Vada Pav at 100 feet road, Shobaghpura– You can get tasty vada pav and it’s amazing variations which seem to be a combo of Indian(vada pav), American(Cheese Burger) and Chinese(Schwan).The other experiments with vada pav also tasted great. 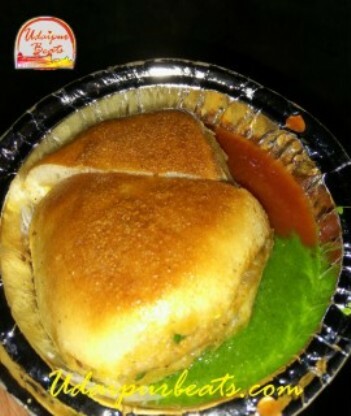 The vada pav at lok kala mandal also serves vada pav with chhach they are popular but the taste of vada pav was disappointing.The pav and the filled masala were lagging in taste and I felt a dip in their taste and quality compared to what they used to serve a few years back. 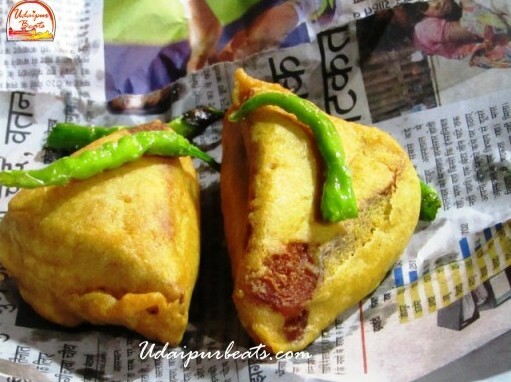 One thing that I missed while having vada pav at most places is the Salted fried chilies as only two of the vada pav sellers provide it, Poornima and Diamond Vada Paav while others being unaware of its importance. 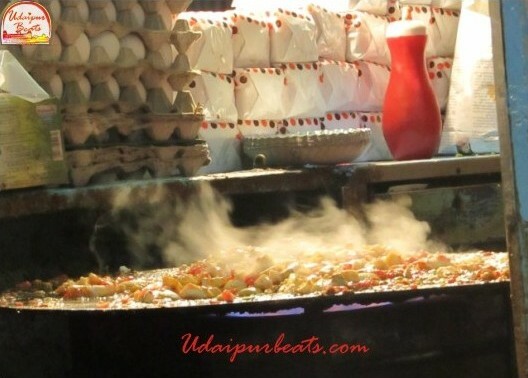 When someone says bhurji we generally think of scrambled eggs but this is not the case here it is rather an egg curry.This is one of the top street foods in Udaipur.Mr. 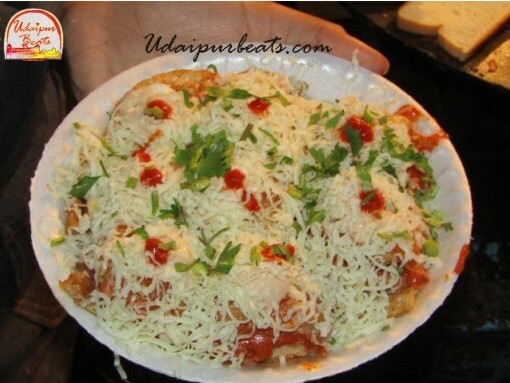 Jai Kumar Valecha who is known as the ‘Egg King of Udaipur’ invented this recipe, Boiled egg cooked with the gravy on a flat tava, the gravy is prepared on tava only with oil, chopped tomatoes, onions, and all spices and then boiled egg pieces added and cooked with it.This spicy egg bhurji is so tasty that people not only from the city but from other parts of the country have become a fan of this dish.The boiled egg bhurji is consumed with the bread slices and it is very spicy, you may get swayed away in its taste but limit your consumption if you are not used to eating extremely spicy food. 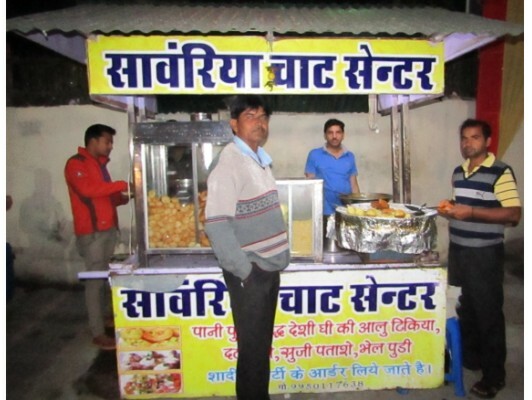 This business was started by Mr. Jai Kumar’s father back in 1984 and Mr.Jai Kumar was brought into this business at the age of 12 when he couldn’t even reach the tawa(pan).He kept on experimenting the dishes of his own, improving them by asking customers feedback and finally coming up with finger licking dishes.Currently, he has around 50 egg dishes invented by himself.He has registered his firm with the name ‘The Egg World’.He also took part in “Masterchef’s Season-4” where he cooked only egg dishes.The journey of Mr. Jai Kumar Valecha from weak financials to becoming ‘The Egg King’ is definitely inspiring. 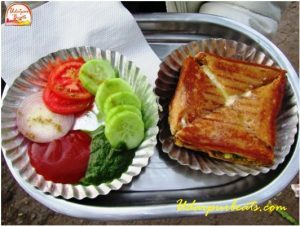 He serves different varieties of sandwiches with great taste especially Matar-Masala cheese Sandwich.The specialty of his sandwich lies in his mashed potato masala which he prepares by adding different spices and chutney.The sandwiches are served in a very presentable manner, in a steel tray with systematically aligned chopped tomatoes, onions, cucumber, sauce, and green chutney. 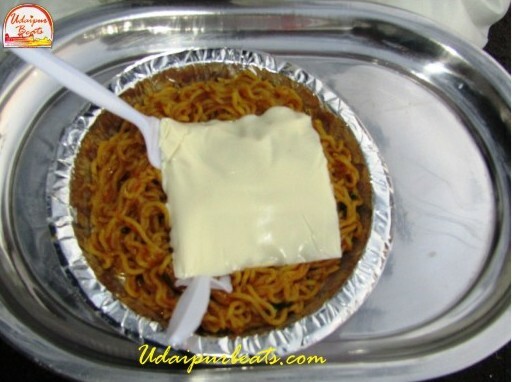 Maggie is his another specialty, he adds onions and some more spices to Maggie which he serves by sticking a cheese slice at the top.You have every bite of the maggie with the cheese cut from the slice and it tastes really really great. 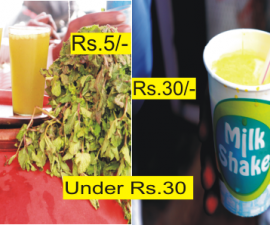 The masala cheese sandwich is priced at Rs 60 while Maggie at Rs 70 but such prices are worth for this taste. There are other sandwich makers at Fatehsagar including ‘Uncle aunty ka sandwich’ but this one is far better than any of those. In Udaipur, we mostly find pani puri with aloo chholey masala which is cooked and hot but I prefer the uncooked boiled mashed potato with salt and chili masala which is served by Saanwariya.The puri here is crunchy and the water is mouth-watering prepared by adding coriander, mint, tamarind, cumin and spices.The overall taste is one of the best in Udaipur.They also serve Aloo-Tikki chaat made in desi ghee. The aloo tikki(potatoe patty) is deep fried in desi ghee and served with layers of Masala chholey, curd, green chutney, imli chutney, chopped tomatoes, onions, coriander, salt, red chilli, and Bhuna jeera, aloo tikki at Saawariya has got fantastic flavor and taste, aloo tikki is moderately spiced soothing to the tongue which lets you enjoy every bite of it. Aloo tikki tastes well only when deep fried in desi ghee unlike the other aloo tikki selling elsewhere which are partially fried from the top and bottom in vanaspati ghee or oil over tava. 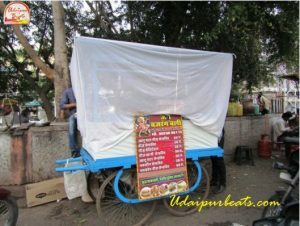 Heeng Paani Puri at Ghantaghar – If you like heeng(asafoetida) flavor than you can go to Ghanta-ghar to have paani puri served with water bearing heeng flavor.Mr. 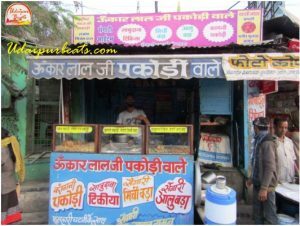 Kailash teli has this stall for 45 years.The stall stands just below the clock tower.Few things I liked about having pani-puri at this place is the moderately sour water-bearing heeng flavor, and the boondi raita they serve in the end which totally satisfies you. 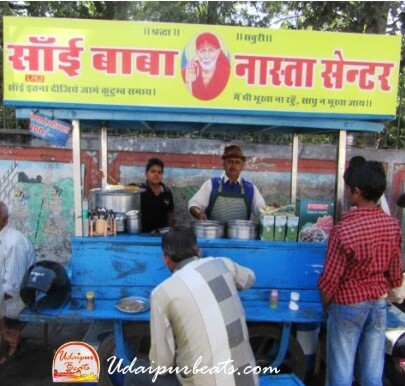 Pani Puri and Aloo Tikki, Bapu Bazaar Main Road- He is also one of the famous Pani Puri and chaat sellers in Udaipur. 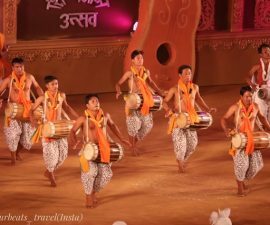 He also serves aloo tikka prepared in desi ghee. 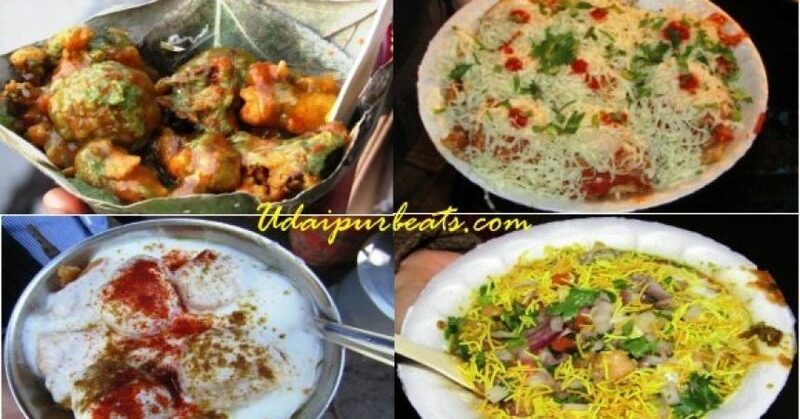 If you like too spicy chaat you can have it here, they prepare strong spicy aloo-tikka chaat, you might get tears in your eyes if your tongue cannot handle spicy food. 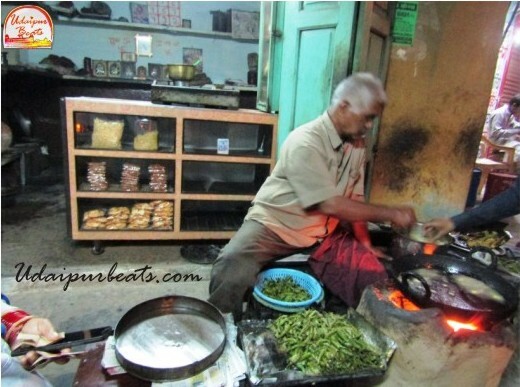 Manak lalji has been making mirchi bada since 1967.He has fixed timings, at 6:30 Pm sharp he ignites his stove to prepare the Mirchi Bada.Manak lalji has got his own taste in the Mirchi Bada and because of his exclusive taste, he is well known in the localities around.He prepares Mirchi bada by filling potato masala lightly in small chilies(normal chilies not the bigger ones generally used for making Mirchi bada) with lemon and deep frying it after immersing it in thin besan mixture(gram flour). 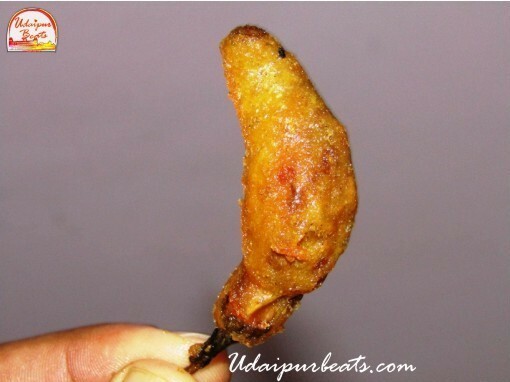 The taste of the Mirchi bada is so liked by the people that people stand in the queue to get these.If you reach past 7:00 Pm then you might have to stand in the queue. This place is not known to many but it is worth giving a try as the Mirchi badas have got an addictive taste.Must visit it at least once! 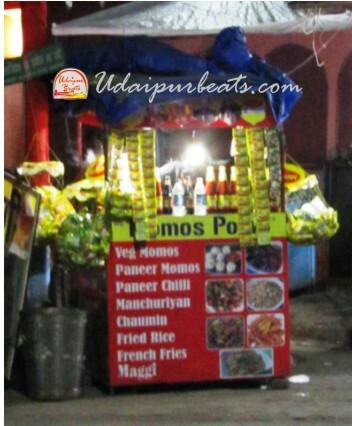 This north-eastern snack has gained so much popularity that it is in demand in every part of the country and you can get some great smoky momos in Udaipur too at Fatehsagar ‘Bombay Market’.You will find this small momo’s stall towards the end of Bombay Market, Boating Side owned by Mr. Manoj Sahu. 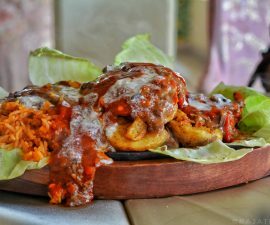 They provide veg steamed and fried momos with schezwan sauce and mayonnaise dip.The momos taste too good with mayonnaise dip, their mayonnaise is sweeter and tastes yummy.The pleasure of having hot momos along the lakeside further increases its taste. The joy of visiting Fatehsagar multiplies with the fresh hot Bread Pakodas prepared by Ajay Bhai.The diagonally cut bread slices stuffed with fried mashed potato masala, dipped in besan mixture and deep fried which makes it a tasty hunger suppressing food.You can also have tea at the same place to add to your pleasure.The bread pakoda is priced at Rs 10 and served in a piece of newspaper with fried salted chilies, this stall stands in the Bombay Market just at the beginning of the coffee shops he is the only one selling bread bada so you can spot him easily.Ajay and his family are into making bread pakoda since 1991 at that time his father had started the business, followed by his elder brother and at last, he joined in and currently working with full dedication. Pratapgarh ki kachori is very famous amongst the people, they serve heeng kachoris.The kachoris taste great as they serve kachoris in leaf daunas with curd and sweet imli chutney over it, after long I saw leaf daunas as they have almost disappeared from the food market.I remember having aloo tikki of brijwasi in Udaipur served in leaf daunas, having food in these leaf daunas imparts a unique taste to the food. 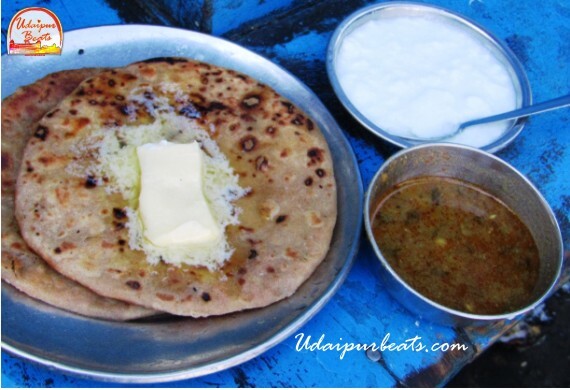 The discussion about street foods in Udaipur remains incomplete without the mention of Aloo Parantha of Sai Baba Nashta Centre. Pokharna Ji at Sai Baba Nashta Centre has been selling butter rich aloo parantha for 22 years.The parathas are prepared in pure desi ghee and served with a huge Amul butter cube sliding over the parathas with curd and spicy daal(lentil).The parathas are damn good in taste and are enough to satisfy the hunger and the taste buds. 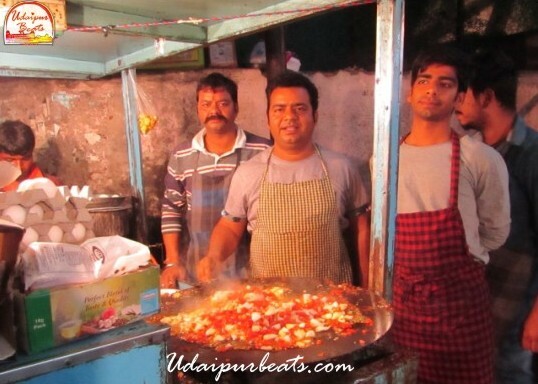 They also serve other variety of parathas such as gobhi paratha(cauliflower), gajar paratha(carrot).Apart from desi ghee and Amul butter Pokharna Ji claims the reason for the unmatched taste is the quality of spices which he is sourcing from a permanent vendor since 20 years.One plate of parathas contains two medium sized thick parathas, with butter they cost Rs 70 and without butter Rs60. 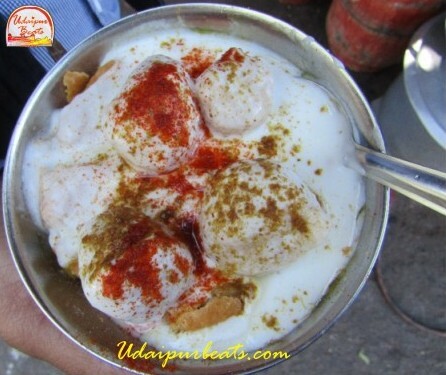 It’s been 20 years since Daya Nashta Centre is providing yummy kachoris.They crush the kachori add Dahi Badas, imli chutney, sprinkle salt, bhuna jeera(roasted cumin) and red chili over it, these all makes it a tempting snack having a mouth-watering taste.One Plate of Kachori is priced at Rs 10 which is an okay pricing for the snack. 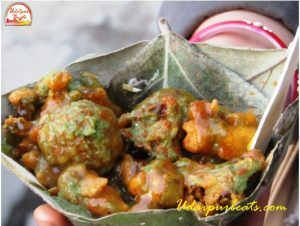 Unkar Lal ji Pakodi Wale is there since more than 50 years, they are known for Pyaj ki Pakodi and ‘Segari’ food(food for fasting).Segari food includes Sabudane ki Tikiya, Aloo Bada, Mirchi Bada, and Kangni Pakoda, everything they serve in leaf daunas.One special segari sweet they prepare during fasting season like Navratri, Janmashtami and Shivratri is ‘Paneer Gulab Jaamun’ which is worth tasting once.They also sell fried masala Ratalu(Yam), which is also called gharadu in other places and is rare in Udaipur. Dabeli and Vada Pav may look close but there is too much difference in their taste and origin.Dabeli originated in Kutch region in Gujrat and as it is from Gujrat it bears some sweetness.Dabeli is prepared by stuffing special potato masala inside the bread buns by making a partial horizontal cut in the middle of the bun and then the bun is heated with butter against the tawa.the potato masala contains mashed potatoes, tarmarind chutney, Dabeli masala, pomogranate seeds, and sev.shankar Kharol, the owner serves best dabeli along with good vada pav, the dabeli costs Rs 20 and is served with green chutney and tomato sauce.He is there since 10 years and his Dabeli looks tempting and tastes sweet n spicy. 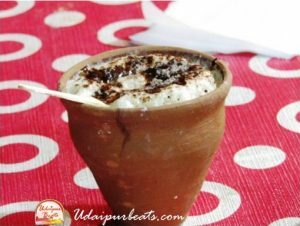 The frothy Kullad coffee sometimes becomes the reason for my visit to Fatehsagar.The coffee froths rising above the brim, the visible chocolate sauce and chocolate powder over the top served in a kullad(mud vessel) makes this coffee a treat.Gossiping with the friends on Fatehsagar pal while sipping kullad coffee is an ultimate pleasure.The milk used in the coffee is the full cream milk which gives it a creamy taste.All the shops in the Bombay Market serve Kullad coffee, I found the coffee at ‘Krishna Icecream Parlor’ owned by Mr. Manohar Singh to be the best in taste. Though it’s not a food but you need it after hogging a lot of food. 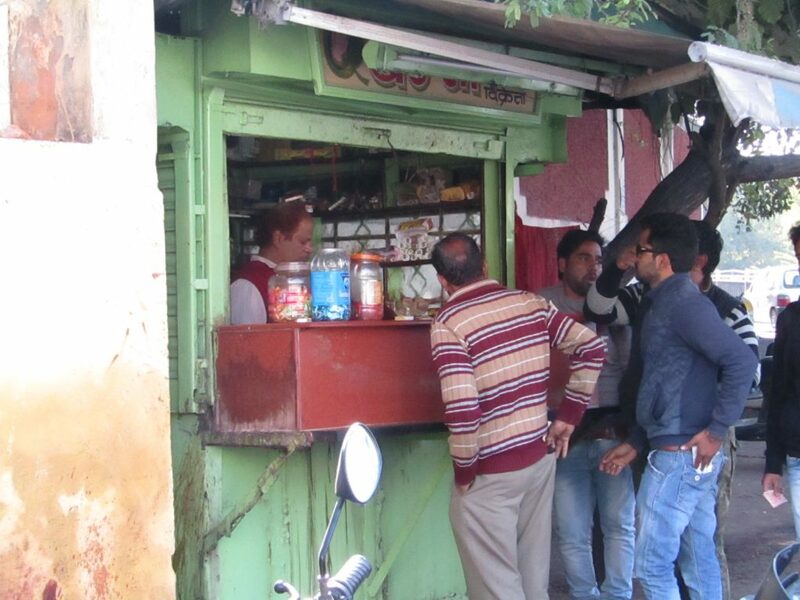 Bansi Paan is known as the best paan seller in Udaipur. 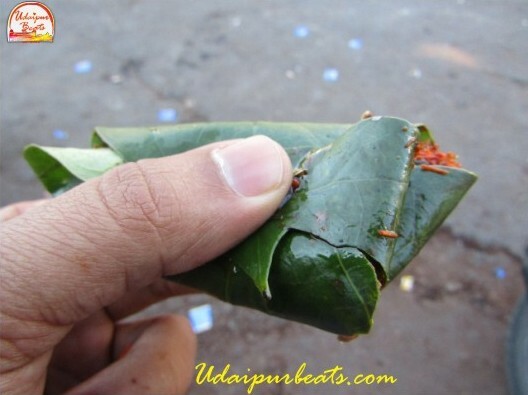 He uses big paan leaves and as a result, his paan is big in size, you might have to cut it in two to accommodate it inside your mouth. 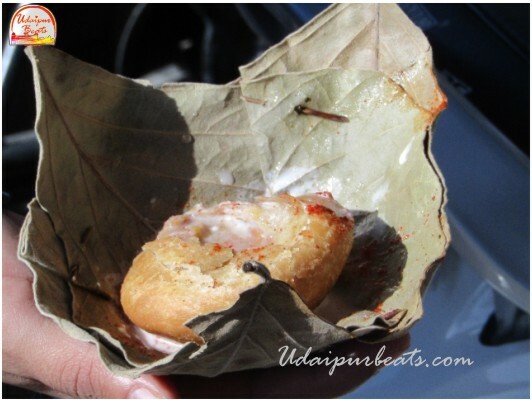 His meetha pan is so minty, sweet, and juicy that it relieves your stomach after having a stomach full meal.Bansi paan is delivering paan to Udaipur since 50 years. 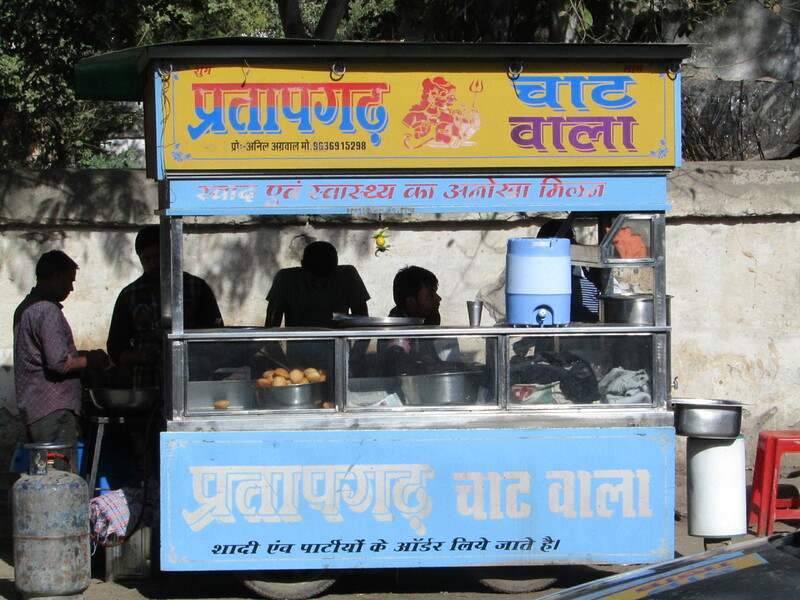 If we have missed out on any street food in Udaipur deserving to be on this list do let us know in comments. 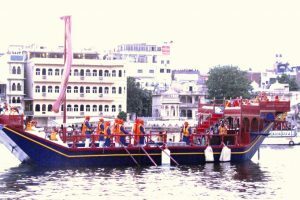 Plz like our Facebook Page Udaipurbeats and get to hear more about Udaipur.